By Keith Cowing on September 20, 2011 12:02 AM. Keith's 16 Sep note: This presentation "Towards Deep Space Exploration: Small Steps versus One Giant Leap" (download) was presented by astronaut Andrew Thomas on 6 September 2011. Inside you will find some interesting stuff regarding the use of existing ISS and Shuttle era plus international and commercial capabilities - all matrixed together allowing us to go to new places. It also mentions problems that occur with the public and Congress when things go over budget or seem to not show any real progress or benefit, and how to use smaller steps to incrementally achieve things in space that are relevant, affordable, and show visible progress within everyone's short attention span. Of course this is all "notional" i.e. ideas that NASA won't connect officially with any actual project or budget anywhere. But that's OK since it shows that people are thinking outside the box, cognizant of limited budgets, and aren't afraid to use old stuff for new purposes. The ideas and approach contained in this document are summarized as follows: "This is not a Program, it is not a Destination; it is a series of activities that aggregate to a deep space capability with US Leadership". There is one problem I have with this document - and it has to do with one specific graphic (page 28 - larger view). Had the author noted that China's plans for the Moon should not spur us to do things out of fear or paranoia or something like that, I'd agree. But using an image that shows a Taikonaut on the lunar surface, planting the flag of the PRC while trampling an American flag is troubling. Are there really people inside NASA who think like this - enough that they go out of their way to create and use a provocative image like this? Alas, China-hater Rep. Frank Wolf will just love this chart. P.S. If some graphics do not work or load it is because the original Powerpoint file's format did not exactly work perfectly for me. Keith's update: Neither Astronaut Andy Thomas, the Astronaut Office, JSC, or NASA PAO have commented on the use of this image. One would therefore have to assume that they are afraid to comment and/or that there is tacit approval of the use of this image in official NASA presentations. None of these assumptions are remotely acceptable. So much for transparency and openness at NASA. I guess its "Lets say nothing and hope this goes away ...". Keith's 16 Sep note: This presentation \"Towards Deep Space Exploration: Small Steps versus One Giant Leap\" (download) was presented by astronaut Andrew Thomas on 6 September 2011. Inside you will find some interesting stuff regarding the use of existing ISS and Shuttle era plus international and commercial capabilities - all matrixed together allowing us to go to new places. It also mentions problems that occur with the public and Congress when things go over budget or seem to not show any real progress or benefit, and how to use smaller steps to incrementally achieve things in space that are relevant, affordable, and show visible progress within everyone's short attention span. \n\nOf course this is all \"notional\" i.e. ideas that NASA won't connect officially with any actual project or budget anywhere. But that's OK since it shows that people are thinking outside the box, cognizant of limited budgets, and aren't afraid to use old stuff for new purposes. The ideas and approach contained in this document are summarized as follows: \"This is not a Program, it is not a Destination; it is a series of activities that aggregate to a deep space capability with US Leadership\". \n\nThere is one problem I have with this document - and it has to do with one specific graphic (page 28 - larger view). Had the author noted that China's plans for the Moon should not spur us to do things out of fear or paranoia or something like that, I'd agree. 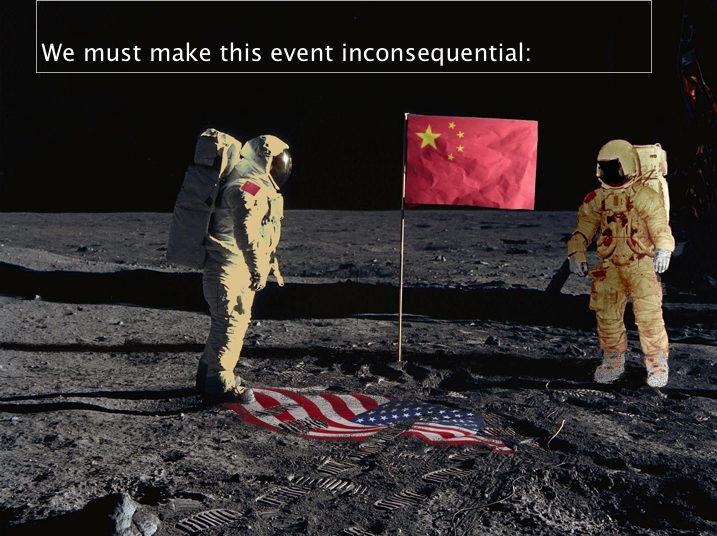 But using an image that shows a Taikonaut on the lunar surface, planting the flag of the PRC while trampling an American flag is troubling. Are there really people inside NASA who think like this - enough that they go out of their way to create and use a provocative image like this? Alas, China-hater Rep. Frank Wolf will just love this chart.\n\nP.S. If some graphics do not work or load it is because the original Powerpoint file's format did not exactly work perfectly for me.\n\n Keith's update: Neither Astronaut Andy Thomas, the Astronaut Office, JSC, or NASA PAO have commented on the use of this image. One would therefore have to assume that they are afraid to comment and/or that there is tacit approval of the use of this image in official NASA presentations. None of these assumptions are remotely acceptable. So much for transparency and openness at NASA. I guess its \"Lets say nothing and hope this goes away ...\". \n\nIt will not go away. This page contains a single entry by Keith Cowing published on September 20, 2011 12:02 AM. Commercial Crew Draft RFP & CCDEV2 Optional Milestones Released was the previous entry in this blog. NASAHackSpace 20 September 2011 is the next entry in this blog.